It is clear that Monday's demonstrations in Iran came as a big surprise to both the government and the leaders of the opposition Green Movement. The fact that people were willing to come out onto the streets in defiance of the security forces showed just how much anger there still was against the government among some sections of the population. It also underlined the emptiness of the government's claims that the Green Movement was a spent force. Since the brutal suppression of the protests triggered by the disputed June 2009 presidential election, the authorities have maintained the line that there is no powerful opposition movement in Iran. As Monday's protests were unfolding across the country - and opposition websites were buzzing with news from the streets - state media were continuing to report that all was quiet. But as Iranian MPs discussed the events in parliament on Tuesday, it was clear from the angry tone of the debate that they were seriously worried by what happened. For the first time, the Majlis heard calls not just for the prosecution of the two main opposition leaders - Mir Hossein Mousavi and Mehdi Karroubi - but even for them to be executed. It is hard to estimate exactly how many people joined in the demonstrations in Tehran and other cities on Monday. One reason is that the security forces did all they could to prevent people gathering in one place. In an echo of the protests on Tahrir (Liberation) Square in Cairo, the demonstrators in Tehran headed for the capital's Azadi (Freedom) Square. But security forces blocked many of the main roads leading into the city centre, meaning that the protests were dispersed. This is exactly the same strategy which the authorities have been using against the opposition as a whole over the past two years. By keeping the leaders of the Green Movement under virtual house arrest, and detaining many others, the authorities have prevented its mainly middle-class supporters from forming a broader network of support across different levels of society in Iran. They have also cracked down on trade union activists, students and women's rights groups in attempt to ensure that none of these could join forces and begin to turn the tide. Like their counterparts in Cairo and Tunis, the opposition supporters who have been out on the streets of Tehran this week are overwhelmingly members of the Facebook generation. But while the protestors in Egypt had both their own military and the US administration behind them, this is not the case in Iran. The powerful Revolutionary Guards are leading the fight against any dissent against the government. And expressions of support from President Barack Obama will allow the government to accuse the opposition of being "traitors who align themselves with Israel" and suppress them. The renewed opposition protests this week have given Green Movement supporters a new sense of hope, but it is clear that the movement is still far from bringing about the kind of fundamental changes which we have seen in Egypt or Tunisia. However, some observers both inside and outside Iran have noted that the opposition is beginning to change. Many of the slogans being chanted by protesters on Monday were aimed against the very top figure in the Iranian establishment - Supreme Leader Ayatollah Ali Khamenei. Some were burning pictures of him and even calling for his death - something which would have been unthinkable before the 2009 election. By isolating the Green Movement's leaders from its young support base, the government might paradoxically have pushed the opposition onto a much more radical course. While Mr Mousavi and Mr Karroubi are still seeking changes within the current system, the increasing anger that was evident on the streets this week shows that some opposition supporters may no longer be satisfied by "reform" and now seek a "revolution". 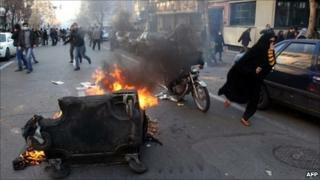 Iran opposition: Will Arab uprisings spread?